I am not a big fan of reality TV and it seems lately that the majority of television programming is nothing but reality TV. I am not particularly found of the sitcom. After you weed out the above, there isn't much left. There are a handful of shows I do watch regularly. I used to watch a lot of BBC America. The first show that got me watching BBC America? Hex. It starred the gorgeous Michael Fassbender before Americans really knew who Michael Fassbender was. It's filled with witches, ghosts, angels and demons and it all takes place at a rural English boarding school. I loved it. Then it was Being Human -- until they had to kill off Mitchell because the actor (Aidan Turner) was contracted to start filming on The Hobbit. The chemistry of the original cast made the show for me. The new characters not so much. I was also hooked on Torchwood which, admittedly, took me a while to get into because of the campy alien makeup but I couldn't resist the charms of Captain Jack (played by the handsome John Barrowman) for long and I became an avid fan of the show. All off the air now. Since then, nothing has really caught my attention. I used to watch a lot of SciFi, er, Syfy Network (Battlestar Galactica -- still on my list of all-time favorite series, Stargate SG-1, Stargate Atlantis, Eureka) but I'm baffled now by their decision to have WWE Smackdown on Fridays which used to be THE night for good SciFi programming. Their programming decisions since canceling well scripted shows and filling the slots with tons of reality TV has left a gapping hole in this SciFi fan's TV viewing diary. I tried watching the new show Defiance but it didn't feel new but rather more like a mishmash of so many other (better) shows that have come before it. I've yet to attempt Continuum. 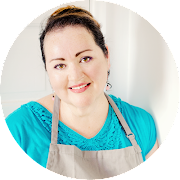 And so this brings me to my latest time-sucker – the one that's been keeping me from writing and cooking and shooting – watching TV shows on Amazon Prime. I used to watch Netflix but since I started having trouble with the iPhone App and my Blu-Ray can't seem to keep the network streaming properly, I switched over to taking advantage of my Prime membership on Amazon. Why did I not watch this the first time around? The writing was decent, Jennifer Garner played the part with a good balance between strong, smart and emotional and who knew? Bradley Cooper AND Michael Vartan? Mmm. Hmm. Yuppers. Loved that discovery. Anyway, just finished the last of the show and I can get back to life. Now what to watch? Suggestions, anyone? Another obsession of late? Toast. Yes, toast. To be more specific: toast with yummy things on it. As in bruschetta, as in crostini, as in tartines or "fill in the blank" on toast. My go-to? Smashed avocado on whole wheat toast with just a pinch of kosher salt and a sprinkle of ground black pepper. It's an easy breakfast for work and now that I've been living with Grams, there's almost always a selection of avocados at home to choose from. 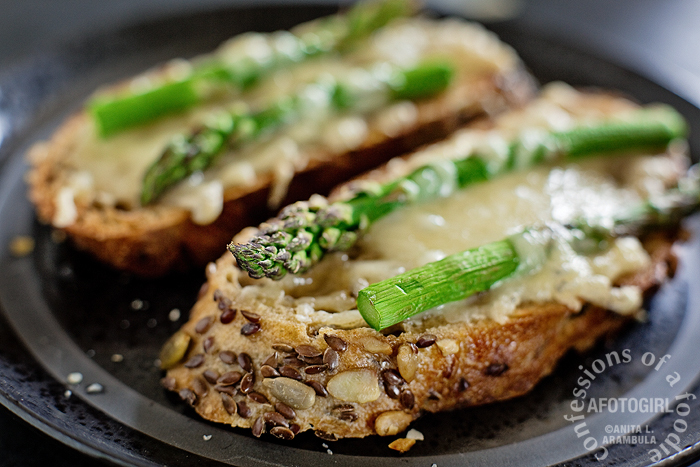 When I'm home and have time, I'll go a little fancier like this gruyere and asparagus on leftover seed baguette. Oh yes. Yes, it was as d'lish as this photo makes it look. These didn't last long after I took their lovely mugs. 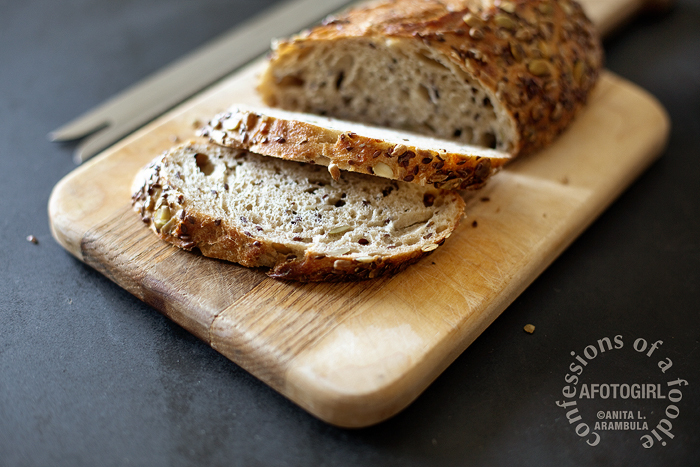 I wanted to call this a "tartine" just cause I thought it sounded cooler but then I read that a tartine should be smeared with a creamy spread like goat cheese or gorgonzola or other soft cheese-like spread. So "on toast" it is. It also feels a little weird "writing" a recipe for this because it's so ridiculously simple. Feel free to use your favorite melty cheese or a different veggie or whatever leftover bread/baguette you have on hand. 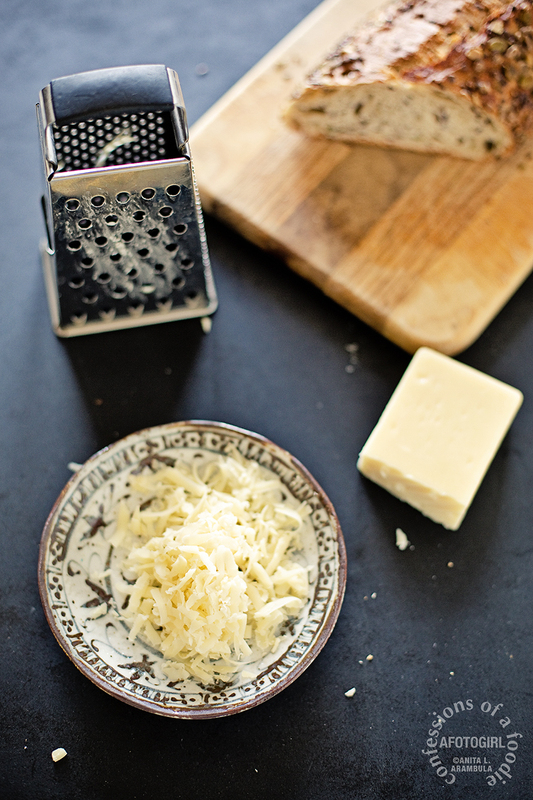 Spread a tablespoon of butter onto each slice of bread. Toast under a broiler or in a toaster oven until butter is melted and edges are just starting to golden. Remove from oven. Equally divide the cheese between both slices. 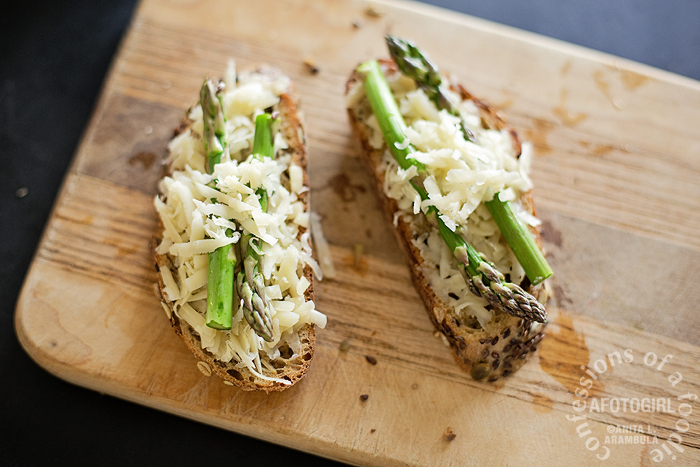 Place two spears of raw asparagus onto each slice. 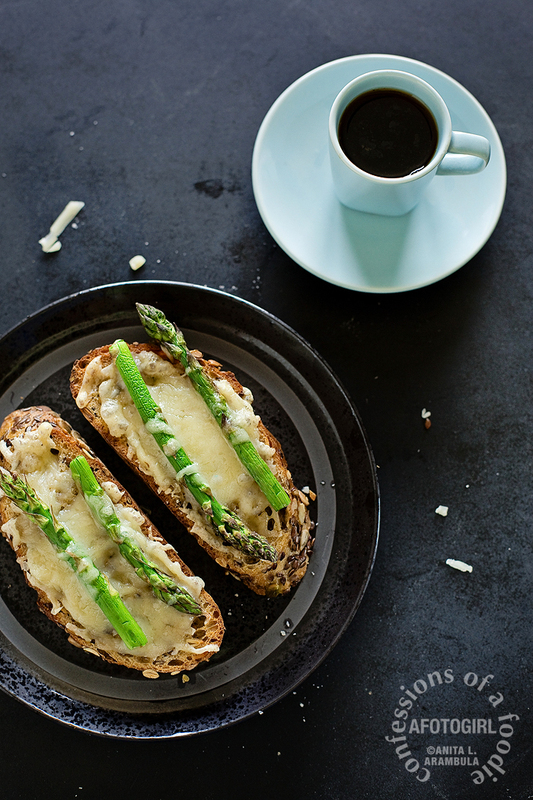 Toast until cheese has melted and asparagus is al dente, about 3-5 minutes. Enjoy! That looks absolutely, mouth-wateringly delicious! Yummm! Now, about your predicament...if you liked Alias, you may like Nikita or even Justified. I know...sounds wonky–country, but after MUCH hounding from a fellow TV addict, I watched the pilot...then the next five episodes in one sitting! I LOVE bad-a** Raylan Givens!! Both shows are on Amazon Prime, which I've just found and LUV! Thank you for the suggestions! Have a great Memorial Day weekend.